The EIA has stats on the total footage of wells drilled for oil and gas exploration and development in the US. I made the graph above from this data showing the number of millions of feet of well drilled. Green is for oil, red is for gas, and grey is dry holes. Dotted is exploration (trying to find new fields), whereas solid is for development wells (getting the hydrocarbons out of known fields). 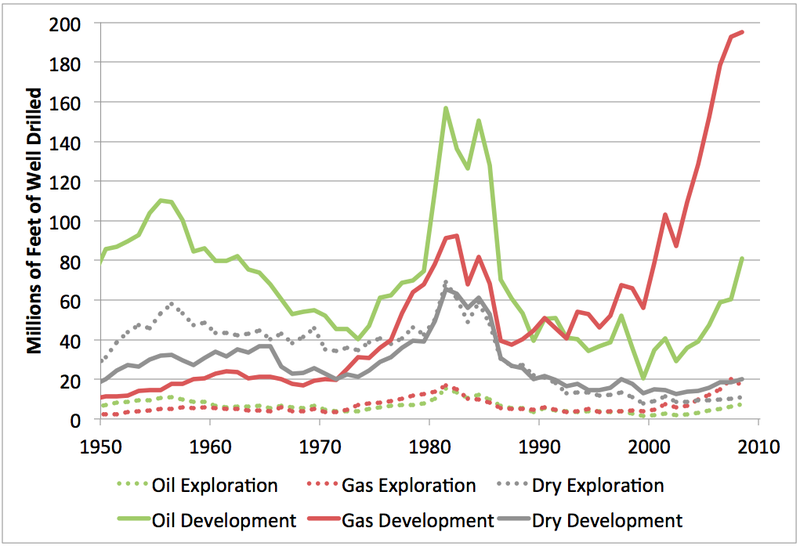 Gas development drilling in recent years is far higher than at any time in US history as the industry exploits shale gas. The industry is much more efficient than it used to be as measured by the amount of dry hole being drilled - it's now a small fraction of all drilling whereas prior to the 1990s it used to be a much more material proportion. Clearly, all that fancy seismic-based computer modeling and precise drilling really works. 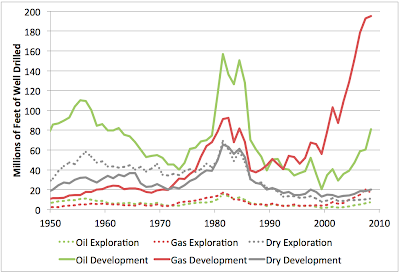 At least as of 2008, oil drilling was nowhere near the heights of the early 1980s (it's very likely increased significantly since, however). Alternate explanation for the good wet/dry ratio -- each hole involves a mess of horizontal drilling, and if the first stabs don't indicate gas where expected, then the rest of the drilling might not follow. Yet another reason why they're drilling so successfully is that they're probably drilling in places that have already been explored. Areas with tight formations were found and mapped out decades ago. Now that they have the technology to produce them, they can just jump right in with production drilling—no need to discover them first. And thus we have natural gas at $2.24 per MMbtu. Problem is these fracking wells are expensive.